For the record I'm not a glitzy, spangly kinda girl, but when it comes to metallic shoes I turn into such a magpie! Maybe it's my inner five year old in denial that I'm never going to grow up to be a princess. Sadly princess is a tough career choice to get into so she'll just have to make do with a moderately princess-esque sparkly shoe. The thing is as outlandish as a gold shoe may seem, metallic footwear actually goes with a hell of a lot more then other colour choice and in fact there isn't a single colour gold or silver doesn't go with. Making them a really easy outfit starting point and because they are on the shiny, spangly side you can keep the rest of your outfit as simple as you like and let your shoes do the talking! I recently invested in two rather shiny pairs of dancing shoes. As seen above. Both Topshop. 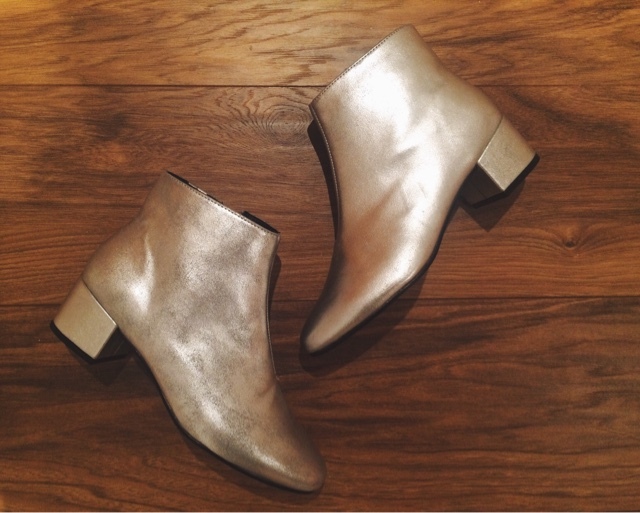 The first is a silver sixties/Ziggy Stardust inspired ankle boot. 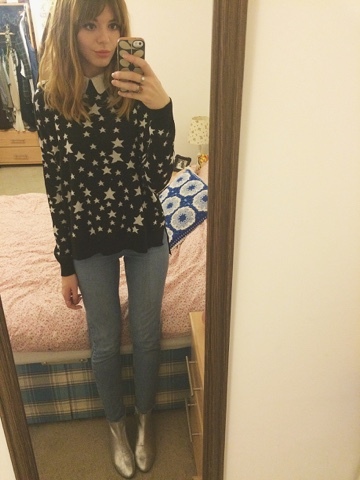 And I hold my hands up and say the outfit I put together followed a David Bowie "Starman" theme, as I teamed them with a star knit jumper also from Topshop, with a simple white shirt underneath to sharpen it up (if you don't already own a classic white shirt I recommend you try Cos and I also recommend you go out and buy one immediately as they are a lifesaver for so many different outfits). I'm not really about "theming" an outfit, but on this occasion I'm letting it slide because a little Bowie inspiration never did any harm. I draw the line at a matching silver jumpsuit and an orange mullet though. 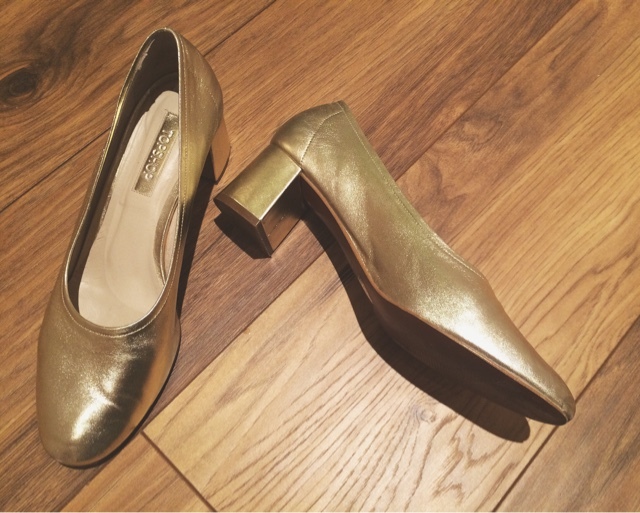 The second pair (and possibly my favourite) are this Celine inspired gold pumps with a block heel. I love them, they are simple, clean and classic. And there's something a little unsexy and gorky about them that I'm drawn too! 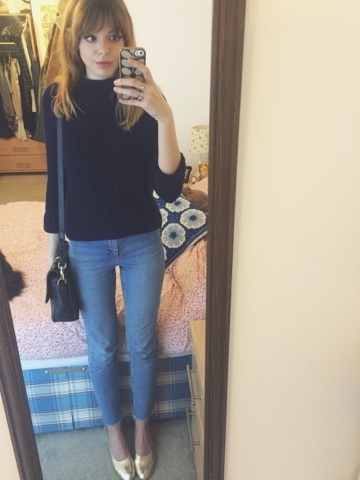 I kinda kept the classic look through the whole outfit with a thick knit navy jumper (like the white shirt, it's another wardrobe essential I would encourage everyone to own) and a pair of stone washed jeans. 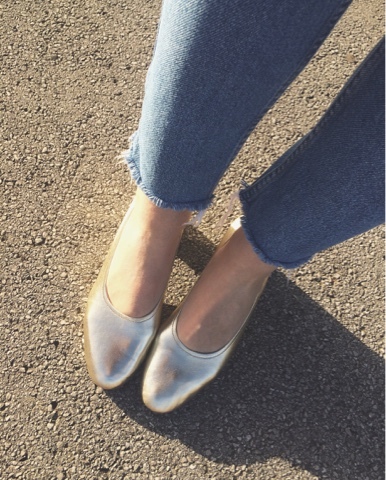 Stone washed denim and metallic shoes are a perfect match. I don't know why exactly, but they are. I decided to give the jeans a little modern twist and DIY frayed the bottom hems, just because this outfit ran the risk of playing it too safe for my liking and I didn't want to look like a middle aged mum. These are both pretty easy outfits, nothing ground breaking what so ever. But they are 2 prime examples of how a gold or silver shoe can fit in just as- if not more- nicely with an outfit then any black shoe could! They're a nice little break away from the norm and add a bit of something to an otherwise safe bet outfit.